Even after our economy recovers, our government will still be on track to spend more money than it takes in throughout this decade and beyond. That means we’ll have to keep borrowing more from countries like China. And that means more of your tax dollars will go toward paying off the interest on all the loans we keep taking out. By the end of this decade, the interest we owe on our debt could rise to nearly $1 trillion. Just the interest payments. Ultimately, all this rising debt will cost us jobs and damage our economy. It will prevent us from making the investments we need to win the future. We won’t be able to afford good schools, new research, or the repair of roads and bridges – all the things that will create new jobs and businesses here in America. Businesses will be less likely to invest and open up shop in a country that seems unwilling or unable tobalance its books. And if our creditors start worrying that we may beunable to pay back our debts, it could drive up interest rates for everyone who borrows money – making it harder for businesses to expand and hire, or families to take out a mortgage. That's when things started to head south. The president's problems arose from (a) his disingenuous blaming of President Bush (surprise!) for much of the current mess -- cheerfully ignoring his own role in doubling the national debt in 5 years, and tripling it in 10; and (b) his nonexistent plan "vision" to actually address the dire challenges he described. After what seemed like an interminable series of dishonest attacks and demagoguery against Paul Ryan's plan (it allegedly abandons the elderly, the poor, the infirm, and especially sick children, leaving them to "fend for themselves"), the president finally outlined the core elements of his approach. In short: More spending, higher taxes, building on Obamacare, and somehow achieving magical "savings" of $4 Trillion over the course of 12 years in the process. We will make the tough cuts necessary to achieve these savings, including in programs I care about, but I will not sacrifice the core investments we need to grow and create jobs. We’ll invest in medical research and clean energy technology. We’ll invest in new roads and airports and broadband access. We will invest in education and job training. We will do what we need to compete and we will win the future. By contrast, Obama claimed the Ryan budget demands cuts so draconian that "if our roads crumble and bridges collapse, we can't afford to fix them." Without a shred of irony, he later condemned the Beltway culture for "petty bickering." [Another element of] our approach is to reduce spending in the tax code. In December, I agreed to extend the tax cuts for the wealthiest Americans because it was the only way I could prevent a tax hike on middle-class Americans. But we cannot afford $1 trillion worth of tax cuts for every millionaire and billionaire in our society. And I refuse to renew them again. Beyond that, the tax code is also loaded up with spending on things like itemized deductions. And while I agree with the goals of many of these deductions, like home ownership or charitable giving, we cannot ignore the fact that they provide millionaires an average tax break of$75,000 while doing nothing for the typical middle-class family that doesn’t itemize. My budget calls for limiting itemized deductions for the wealthiest 2% of Americans – a reform that would reduce the deficit by $320 billion over ten years. 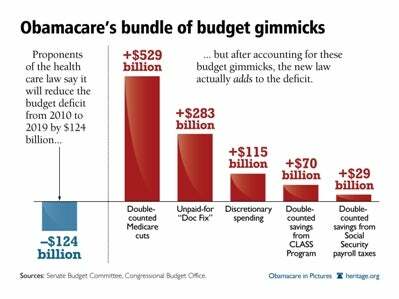 But to reduce the deficit, I believe we should go further. That’s why I’m calling on Congress to reform our individual tax code so that it is fair and simple – so that the amount of taxes you pay isn’t determined by what kind of accountant you can afford. Here, the president yanked the extension of all current tax rates off the table, even though he claimed that "everything" should be "on the table" elsewhere in the speech. He also endorsed his debt commission's tax code simplification recommendation, a version of which is included in Paul Ryan's plan. Both Simpson/Bowles and Ryan call for across-the-board rate reductions in addition to a simplification regime, which would broaden the tax base via the elimination of endless deductions. So the president explicitly embraced this plan...but curiously also demanded higher taxes on "the rich." I'm not sure how to reconcile these competing preferences. Speaking of those awful rich folk, much of the president's tax rhetoric was laden with intense class warfare. He repeatedly stated that "millionaires and billionaires" need to pay their "fare share" of taxes (Quick fact: The top 1 percent of earners already pay nearly 40 percent of all income taxes in America) to help "win the future." He also channeled candidate Joe Biden by suggesting that paying ever higher shares of one's income to the federal government is a patriotic act. In a nutshell, he plans to raise taxes on successful job creators and businesses -- even in the midst of a recession -- because they can "afford it." "Politicians are often eager to feed the impression that solving [the debt] problem is just a matter of eliminating waste and abuse..."
Step 1: Think about Medicare and Medicaid savings. Step 3: Hundreds of Billions in Medicare and Medicaid savings! o Make Medicaid more flexible, efficient and accountable without resorting to block granting the program, ending our partnership with States or reducing health care coverage for seniors in nursing homes, the most economically vulnerable and people with disabilities. Combined Medicaid savings of at least $100 billion over 10 years. o Reduce Medicare’s excessive spending on prescription drugs and lower drug premiums for beneficiaries without shifting costs to seniors or privatizing Medicare. Combined Medicare savings of at least $200 billion over 10 years. In early May, the Vice President will begin regular meetings with leaders in both parties with the aim of reaching a final agreement on a plan to reduce the deficit by the end of June. I don’t expect the details in any final agreement to look exactly like the approach I laid out today. I’m eager to hear other ideas from all ends of the political spectrum. Well, Mr. President, it would be rather difficult for this mystical bipartisan plan to "look exactly like" something that doesn't exist, so I wouldn't worry too much about that. Also, are you authentically interested in hearing ideas "from all ends of the political spectrum"? I ask because moments before you uttered those words, you spent ten minutes lying about an approach largely embraced by virtually an entire end of the political spectrum. You also said the same thing about healthcare reform, and your final plan was so bipartisan that it received exactly zero Republican votes in Congress. Pardon my skepticism. Bottom line: If American taxpayers were hoping to hear concrete, courageous, politically-risky solutions to our looming debt crisis, they might as well have followed the Vice President's lead.